In an early September post I described a project for Portland Metro and the University of Oregon to implement data-driven visualization using ESRI’s CityEngine. I completed the work at the end of October and wanted to share some terrific results. The goal was to create a 3D model of an urban landscape similar to the simplified physical site models architects use, and to compare alternative development strategies using a real place and real development data. Starting with projected development patterns for the City of Portland’s Gateway District, we set out to show how the assigned development types would affect growth over the projected period, and to visualize alternative development choices. The progression of images here shows the action of the algorithms implemented. Initial conditions mapped onto grid. First, we imported tax lot and building footprint information from Portland’s traditional GIS map sources. On top of that we overlaid a 264 x 264 foot grid used for development planning purposes. 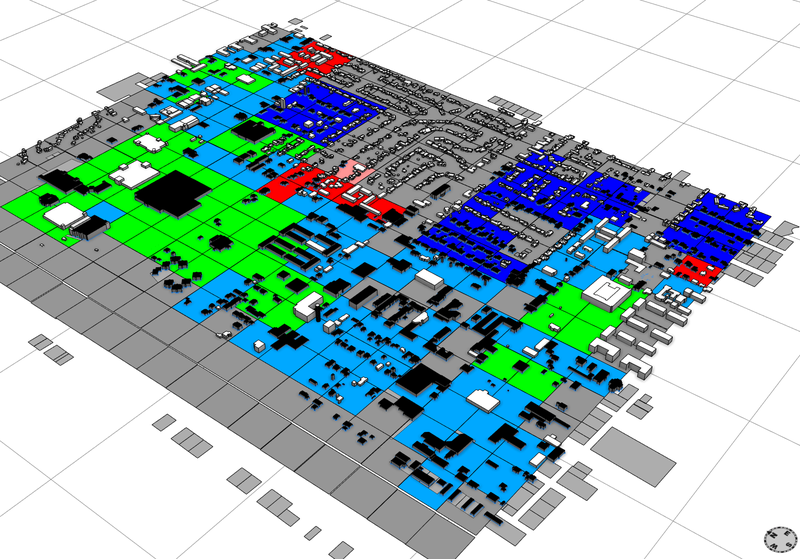 Each grid cell was annotated with one of sixteen proposed development types: Residential, Office, Light Industrial, etc., differentiated by color. To show initial conditions, I then created iconic building types on existing building footprints. Black buildings represent structures on under-valued properties identified for redevelopment. White structures represent buildings likely to remain intact. I based approximate building heights on Lidar data. 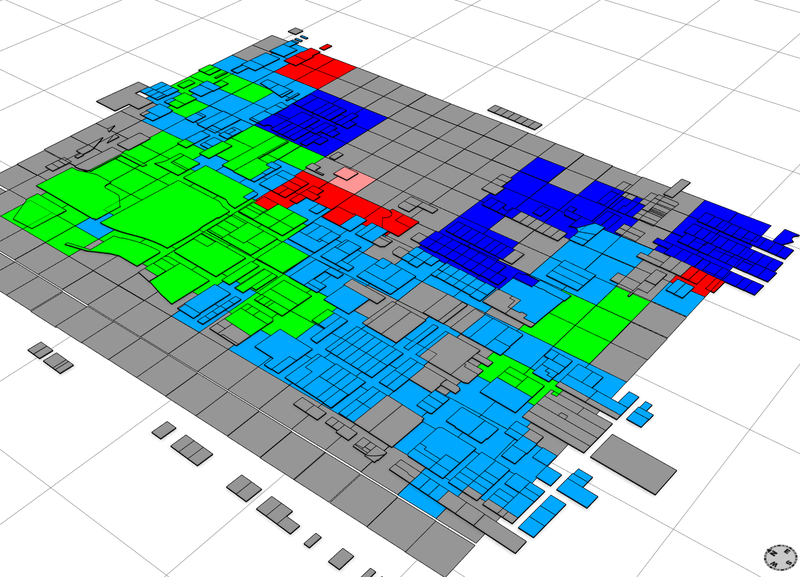 Using Python inside CityEngine, I mapped the lots to their containing development grid and development type. 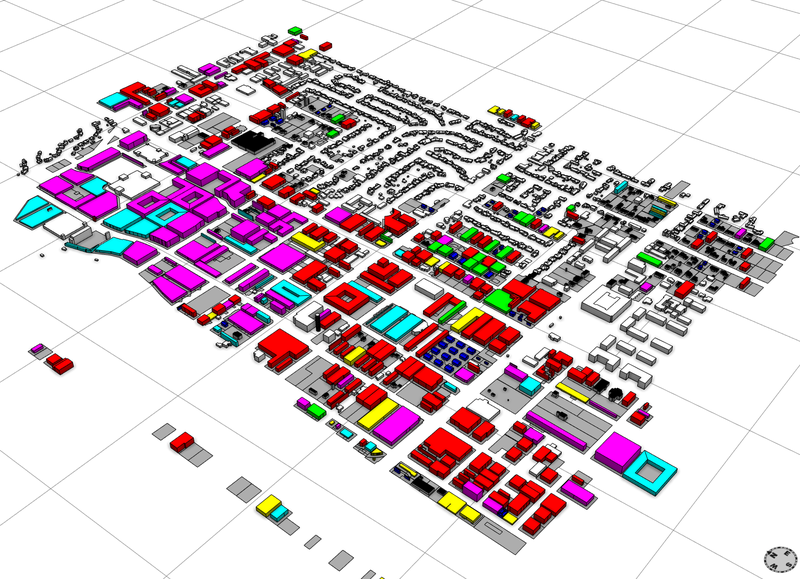 An Excel spreadsheet mapped each development type to a mixture of 6 building types. Sorting the tax lots by their valuation, I split them into three sets and “redeveloped” each set by deleting the existing buildings, sub-dividing the largest lots, and assigning an appropriate building type based on job and housing goals for the particular development. Using both color and form, I ultimately created iconic models representing each of the building types on a lot. Employing the generative algorithms, it is simple to enter different data into the spreadsheets and update the resulting growth patterns under alternative scenarios. The final image above, for example, shows how the Gateway District might look if 66% of the lots identified as “underutilized” by the City of Portland were redeveloped. ← Heliotrope Switches to Creative Commons Licensing!